An tray-loading iMac will be dissambeld for a spring cleaning! 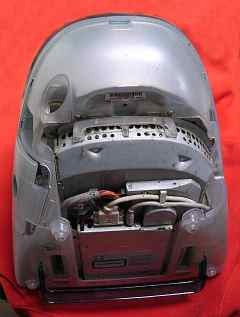 In particular, we will focus our attention the (now) very noisy fan and doing this, we will see how to add RAM, change the hard disk and the internal battery. First we put the iMac screen down on a soft textile. 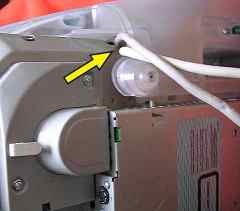 Under the handle (blue arrow), a screw (yellow arrow): remove it. The screw now out, the upper part of the iMac's case can be slightly removed by pulling it to the top. 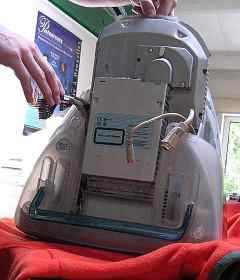 Here, the vacuum cleaner can already be used to remove the dust. 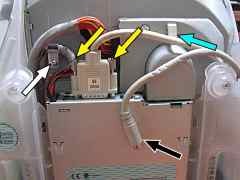 2) unplug the cables on the right from their support (blue arrow). 4) ... but the screen connector (old Apple DB15 proprietary format) is screwed down (yellow arrows). Also unplug the black connectors. While keeping the cables out of the way, just slide the mother block to the top. On the right, the CD drive (fixed by two screws). 3) the white arrow on the top points to graphic chip, the white under points to the slot for an extra VRAM board. 4) The black arrow indicates the screw to be removed. 5) And just above this black arrow, the PMU reset switch. 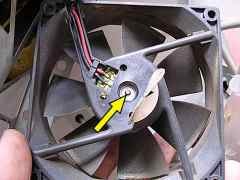 We remove the cooling unit clamping spring and remove the unit. 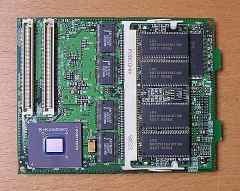 Now the board on which are fixed the processor and the RAM supports can be extracted. This board is, on the left, locked onto two special connectors (yellow arrows) and, on the right, simply engaged inside the metallic case (blue arrow). 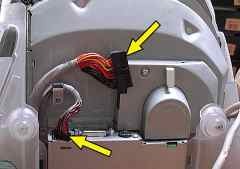 In this very, very critical part of the iMac... do not force on any parts: if the part cannot be constraintless unplugged frow a connector, this surely because you pull it in a wrong manner! The metallic case is to be vacuum cleaned, other pieces can simply be puffed. Surprisingly, no thermal paste onto the CPU unit! * the support for the extra RAM: small sized this one! Now looking for the hard disk. ... and remove the IDE cable (blue arrow). 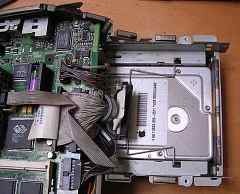 The CD drive is now freed: in fact, except for the two screws which has to be removed, the drive is simply locked by a spring. So the drive has to be gently pushed towards its back... towards the motherboard in fact... to be removed. 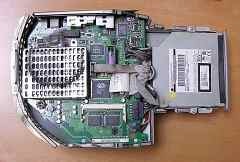 So, the last piece we discover on the picture is the hard disk. The last, but certainly not the least, operation to perform. 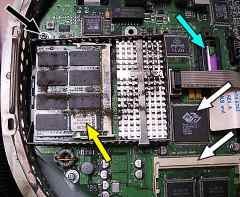 The simplest way to remove it: to remove first the motherboard. ... and the one pointed by the yellow arrow. 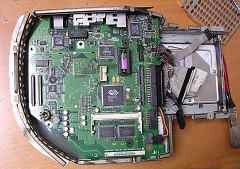 We can now safely disconnect the mother board from its chassis. Caution: many connectors and cables to be slightly unplugged. 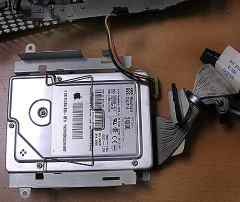 The hard disk can now be operated. 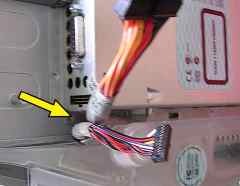 On the picture, the power cable is above and the IDE cable (also used for the CD drive) below. The IDE cable passes inside a ferrite ring: this ring acts a a Faraday's cage to prevent the electro-magnetic field generated by the IDE cable (yes, small electrical values...but non zero values!) 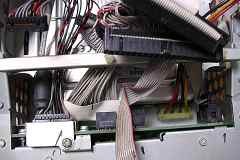 to intefere with the mother board circuits (placed just above the hard disk). The two screws pointed by the yellow arrows have to be removed and the ones on the rear side also! 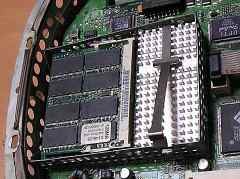 One can put a bigger hard disk, but the hard drive controller only allows a maximum capacity of 128 Gigabytes. The hard drive back in place. 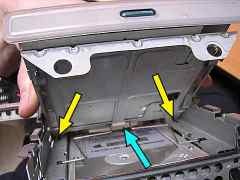 To put back in place the CD Drive, one has to put the spurs into their nicks (yellow arrows) and clamped the craddle in the spring (blue arrow). 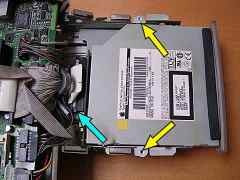 Push the spring towards the rear part of the drive and let it to slightly relax: the spurs muts appear on the locations pointed by the yellow arrows. 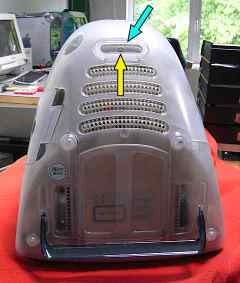 Blue arrows show the two digged up area which help to position the block into the iMac's chassis. 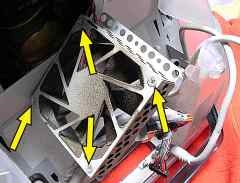 As we just remove the block containing the motherboard, it is the right moment to pay attention to the CPU's fan. So a deep cleaning is required: vacuum cleaner and paintbrushes on the deck! 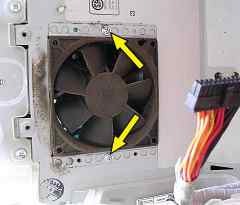 We can extract the screws (yellow arrows) and remove the fan's craddle from the cockle. ... and again four screws! Clean it. Remove the sticker and spray a little bit of sewing machine oil on the fan's axis. Place the sticker back! 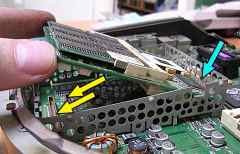 Take care, when sliding the mother board block into place, that the two digged up areas in the chassis exactly match the plastic spurs (yellow arrows). Do not forget to put all the cables back in place, exactly where and how they were before removing them: every single place is reckonned on an compact iMac!